Finally. I feel like I have lost my mojo for a bit too long... so many projects - but I may be nearing the finish line for some of them. 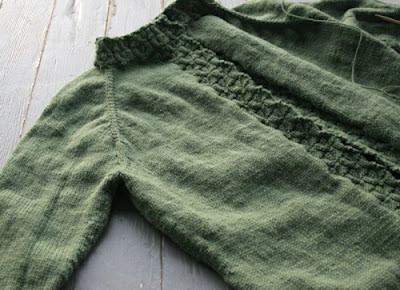 At least that is the case with currant-knit in lichen. I can't wait to have this one off my needles! Labels: cardigans, cecily's winged knits, needles, quince and co. It's such a lovely feeling when you've finished a project isn't it! Your cardi looks lovely and well worth the effort. I spend my life with constant projects on my needles so always have a few things on the go ... and keeping motivated can be a problem.